…were the first words out of my son’s mouth a few minutes ago when he came home from work. That really threw me off until I remembered that I pulled into Romano’s mkt on the way home from confession today and without thinking walked home leaving my car parked there. Good thing he mentioned that or I would have been in quite a panic in the morning. How do you forget your car? Item: Apparently environmental groups have decided that their love for the environment doesn’t trump their loyalty to the dear leader president. Actress Q’orianka Kilcher chained herself to the White House fence while her mother slathered the “Pocahontas” star in black paint meant to look like oozing crude. Kilcher’s cause? Not the Gulf spill at all but oil-related abuses of indigenous people in Peru, whose president was visiting Obama that day. As the greatest environmental catastrophe in U.S. history has played out on Obama’s watch, the environmental movement has essentially given him a pass — all but refusing to unleash any vocal criticism against the president even as the public has grown more frustrated by Obama’s performance. About a dozen environmental groups took out a full page ad in the Washington Post Tuesday – not to fault Obama over the ecological catastrophe but to thank him for putting on hold an Alaska drilling project. After all its one thing to protect the environment it’s quite another to protect the higher cause of Obama, and if the environment has to suffer well so be it. After all once oil drilling is allowed in Alaska, you can’t fund raise based on stopping it can you? Item: Speaking of oil drilling apparently. You mean that the administration is actually misrepresenting the facts from their own reports? Why would one do such a thing? Why because the ends justify the means of course. Homeland Security Secretary Janet Napolitano believes Mosab Yousef is a national security threat, and wants to send him back to Palestine. According to Yousef writing on his publisher’s blog, he is now Homeland Security File# A 088 271 051. He is scheduled to appear before Immigration Judge Rico J. Bartolomei at the U.S. Department of Homeland Security Court in San Diego on June 30th at 8 a.m.
As you can guess people of sense are up in arms over this nonsense. The only people he is a threat to is our enemies. Forgetting the fact for the moment that letting him stay is the right thing to do, letting him stay is also the SMART thing to do. How are we going to encourage people to be warn us on terror attacks if we throw people who help stop them under the bus? Not a wise recruitment tool. I would encourage you to contact your representatives on this matter. Why on earth would this administration act this way? The question answers itself. 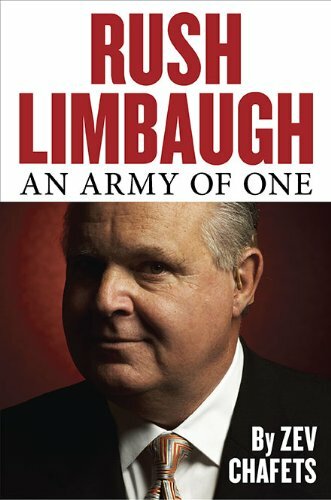 My review of Zev Chafets book Rush Limbaugh an Army of One is available at Amazon.com here. In my opinion it is the most balanced portrayal of this important historical figure that you will read. A government health committee Friday recommended not changing the ban on gay men donating blood but also called for new research on alternative policies, citing flaws in the current rules. Gay men have been prohibited from giving blood since 1985. But momentum to change the ban has grown recently, with advocacy groups, blood-collection organizations and members of Congress calling for the Food and Drug Administration to revise the donation rules. The safety of the US blood supply is of paramount importance, once that is lost or confidence in it is lost all bets are off. The American Plasma Users Coalition, representing people who depend on the blood supply to maintain health, urged additional research, forecasting that revisions in the donation rules eventually will be made. Forgetting the risk to lives for a moment if you want to increase litigation and cost to a healthcare system this is the way to do it.